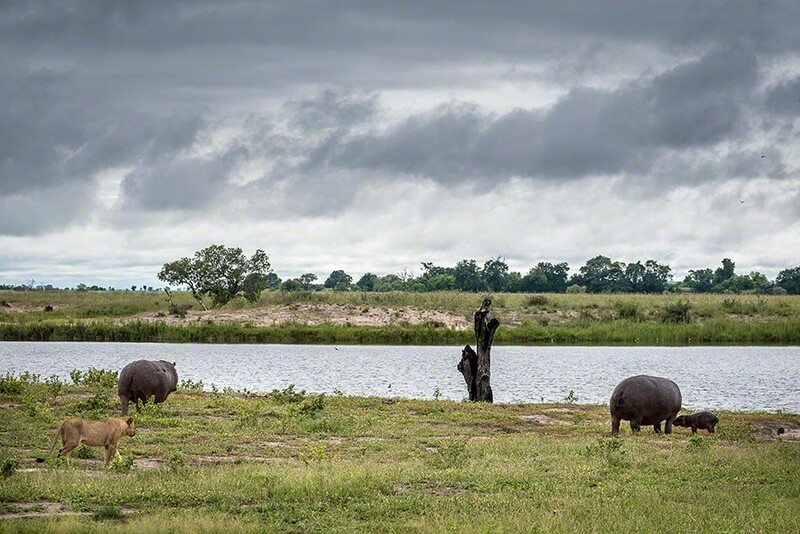 The drive from Savuti to Chobe was a very long drive with rain most of the way. Getting there, we drove through a large reserve of Teak trees. Cutting of teak is prohibited in this reserve. We've seen impala in all the parks, but Chobe seems to have thousands. They are everywhere. 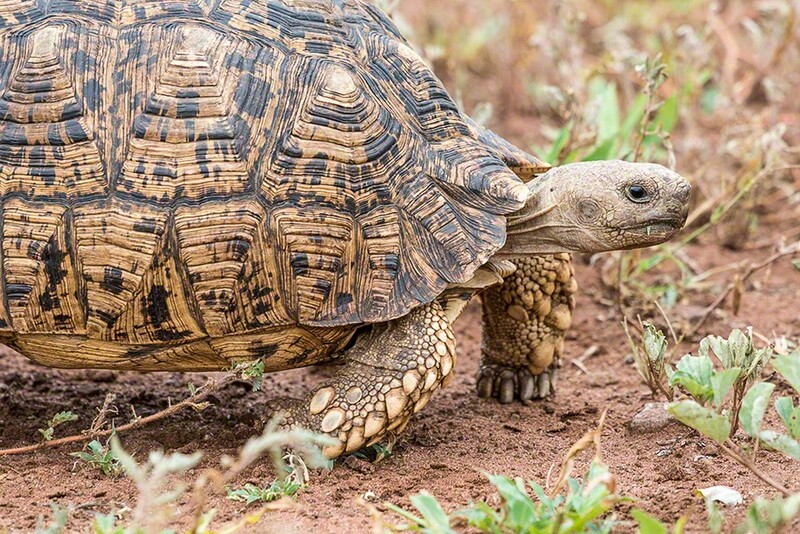 Near one of the large herds of impala, we spotted a Leopard Tortoise. 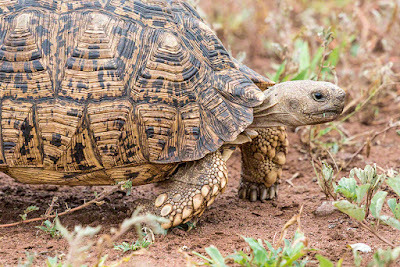 This tortoise is one of the "small 5" of Botswana. The geology of Chobe is another unique feature. The soil in this part of Chobe is quite red, and the western park boundary is also the border of Botswana and Namibia. Botswana is higher than Namibia because the Namibian land sunk as a result of an ancient geologic event. 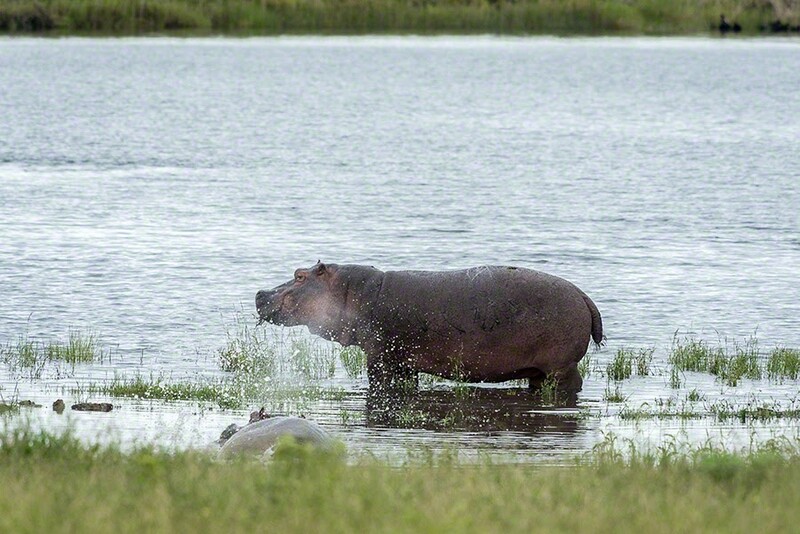 The Chobe River divides the two countries in this area. 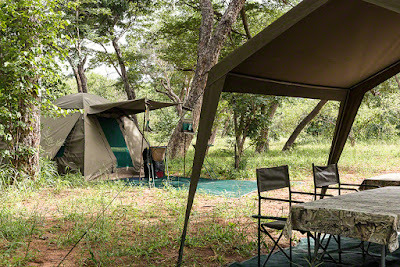 After a short siesta at our camp, we headed out to explore more of Chobe. Like in Savuti, there is a large and fierce pride of lions. We went to look for them. In our search, we saw more impala, elephants, banded mongoose, and we found a lion family lounging in the road. This group included several adult females, mixed sub-adults, and young cubs. We could see nine lions on one side of the road and on the other side was one 16-month old male whose mane was just beginning to grow. 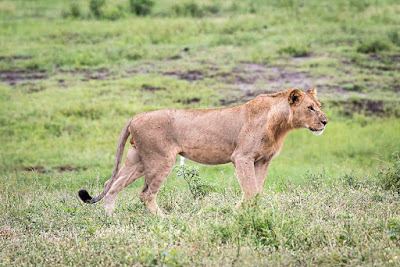 From a nearby bush we could hear the sound of new cubs and see a female. The unseen cubs sounded like Tasmanian devils with their little screams, roars, and meows. 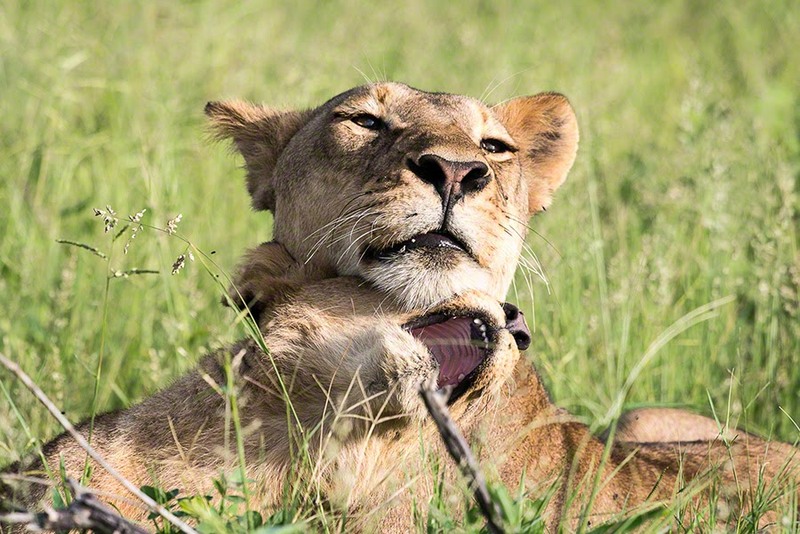 We lingered with the lions until almost 7pm and returned to our campsite as daylight was turning to dusk. As we were freshening up for dinner, Moses saw a lion laying in the grass behind his tent. He quickly let us know that there were lions about. His order to us was to "minimize our movements." Eddie our chef had been cooking three kinds of meats for our last dinner in the bush and the lions thought they were invited. Within in minutes, daylight was completely gone. Moses shined a flashlight into the grass and we saw eight pairs of lion eyes staring back at us. Moses and Duks set up additional lights around our dining canopy, and we continued with our dinner plans, moving slowly, and sat down to eat a fabulous meal. 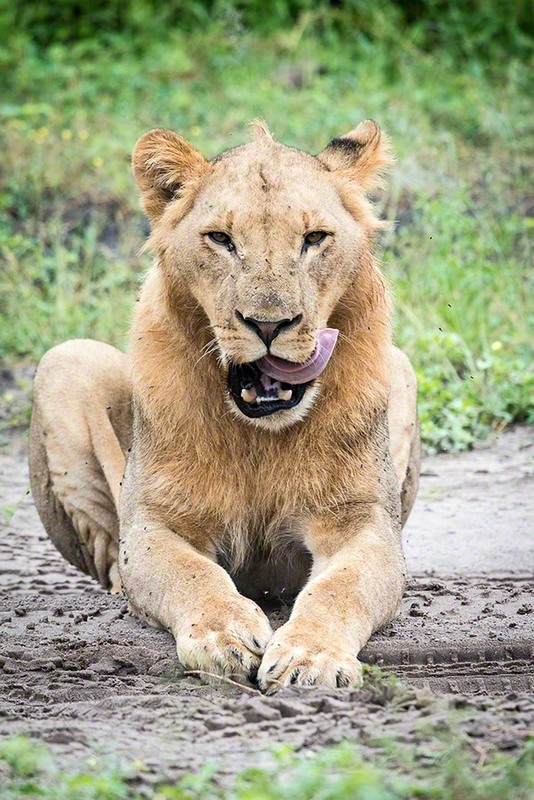 Eddie, the chef, bravely sat with his back to the lion infested grass. 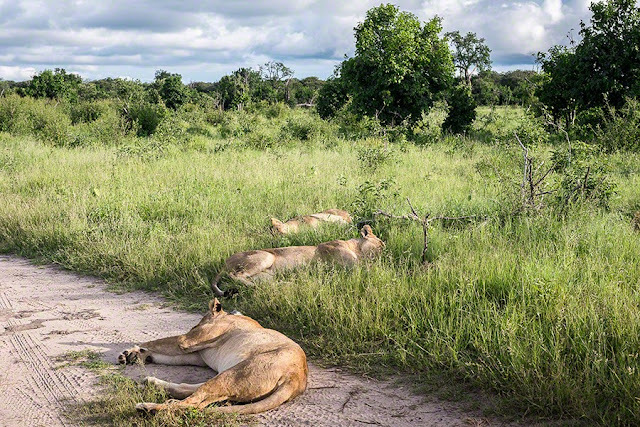 Within a few minutes we saw the dark forms of the lions move, grumbling and making low calls, away from our campsite. Whew, eight lions and five humans walking! That was exciting and scary, and it meant that I wasn't going to sleep well--I didn't. Sleep didn't come easy or fast to me, but I must have fallen asleep because I woke to the noise of group of elephants grazing next to our tent. In the night I heard the low calls of lions and trumpeting of elephants. Then, it began to rain hard. In the morning it was still raining while we packed and ate our last breakfast. Moses took us for a last drive in Chobe. 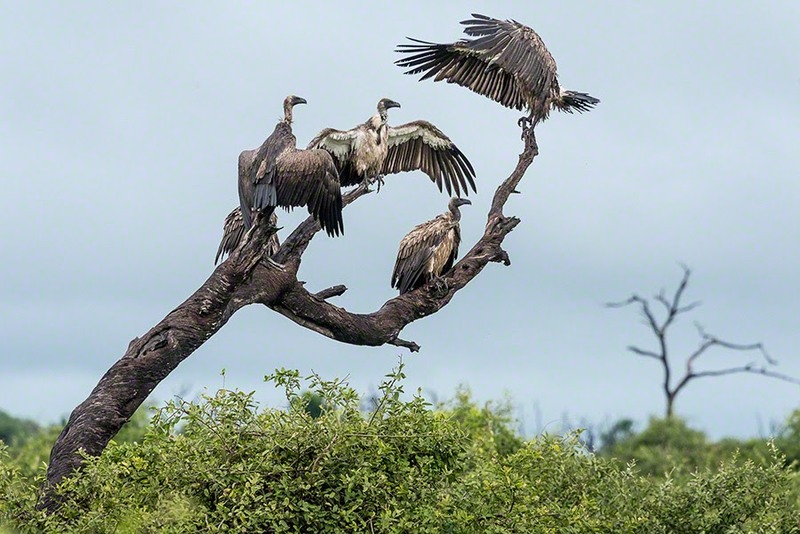 It took three hours to get to the park gate and along the way we saw some white-backed vultures perched on a dead tree. The group of lions we saw yesterday afternoon, were still in the same spot. They were so lazy, probably full from last night's hunting, that we didn't stay long. 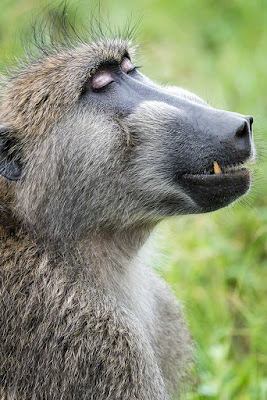 We watched several large Chacma Baboon groups. This guy contently sat next to the truck alternately dozing and serenely watching us. At the Chobe River we found a drama in the making. We saw a sub-adult male lion sitting on a small hill in front of a depression. Soon, a female hippo and her very, very young baby emerged from the depression followed by the male hippo. 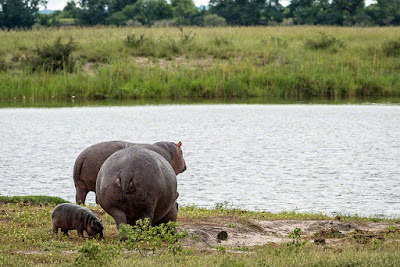 The hippo family slowly headed toward the river with the lion following. 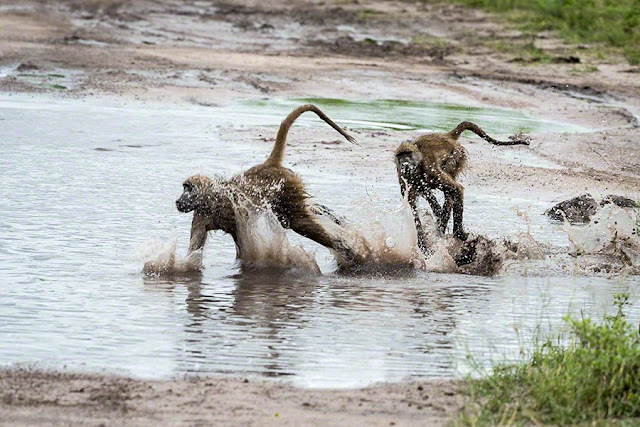 The mother and her child finally made it safely to the river where they were safe from the lion. 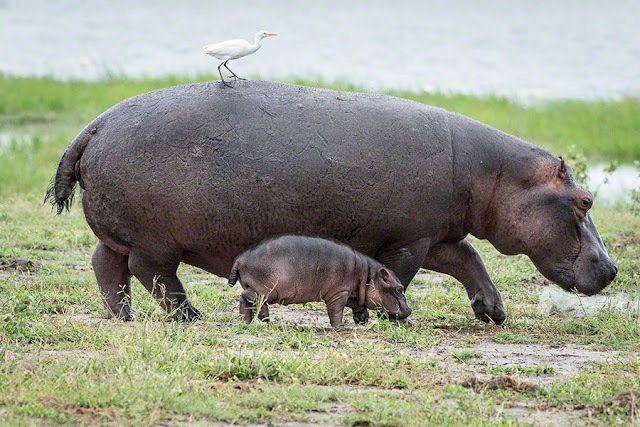 The male hippo kept watch until the baby was safe. 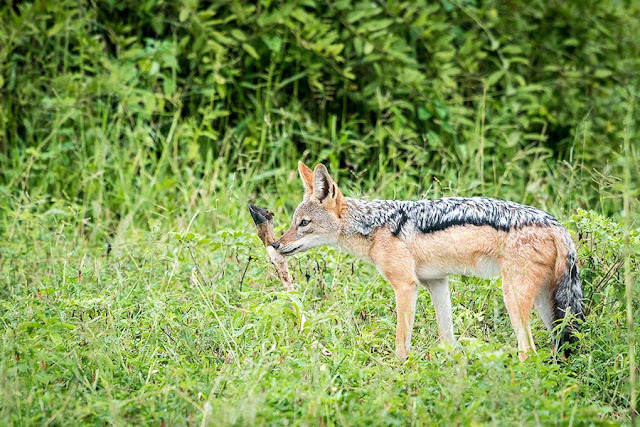 Not too far from the river, we found a black-backed jackal enjoying someone's leftovers. 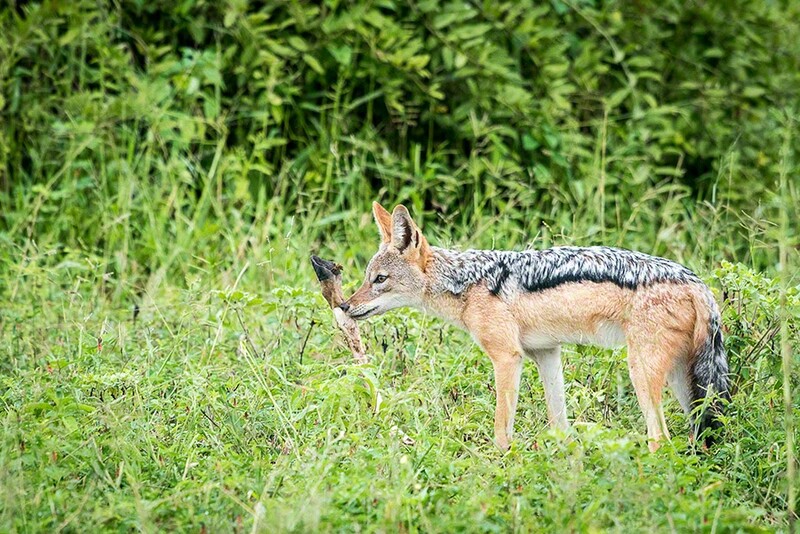 He was chewing on the leg of an impala. We found more baboons enjoying the puddles caused by the recent rain. 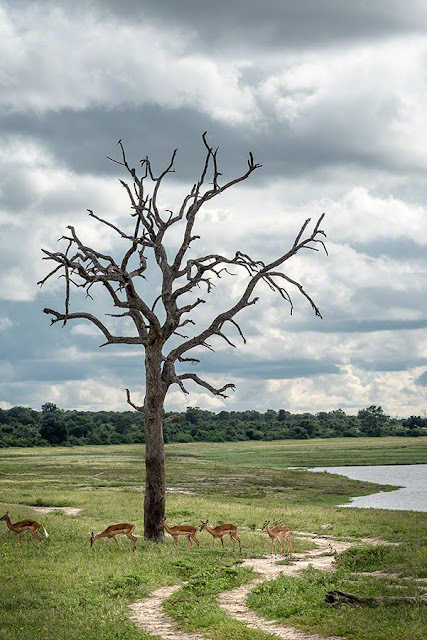 Each day that we have been in Botswana, we have seen giraffes. This last day was no exception. The giraffes and some impala had placed themselves near the exit gate and it was like they were saying goodbye to us. Moses delivered us to the Kasane Airport for our flight to Johannesburg. 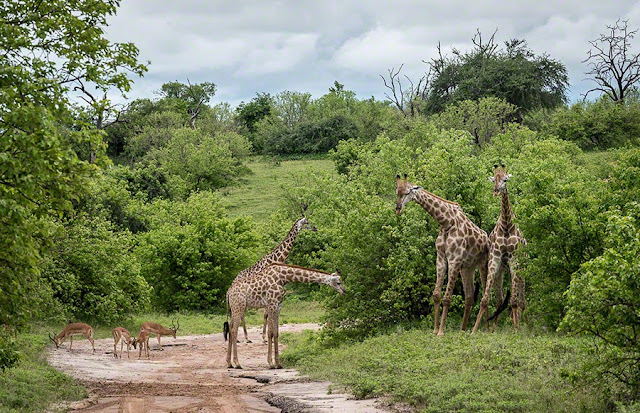 Besides four of the "Big 5" we saw hundreds of giraffe and zebra, thousands of impala, and so many other amazing animals like hippos, the cheetah, the caracal, baboons, monkeys, many different kinds of antelope and birds. Our guide was Moses. 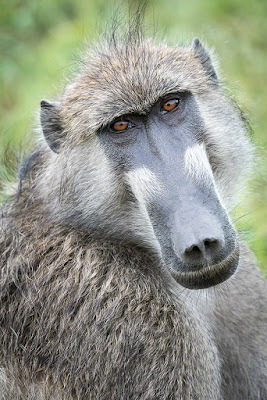 He is the owner of Unlimited Tours & Safaris UnlimitedSafari. We asked Unlimited Safari to design a trip for the two of us and couldn't be happier. Our chef was Eddie and he along with Duks made sure we had excellent food and a comfortable tenting experience complete with hot showers and a clean camp toilet. Credit cards (Visa & MC) were widely accepted in Maun (the town we flew into to begin our Safari) and at the airport in Kasane.